A common problem that we uncover while doing professional home inspections of luxury residences in Fort Lauderdale involves the range hood over the oven and the duct that it exhausts to. Maybe 2 in 10 have a clean oven hood and filter, but 99% will have the makings of a grease fire in the duct the exhaust fan blows into. Range hoods, filters and ducts are probably the least cleaned items in the entire home. The reason for this neglect is twofold. First, all your eye really sees, unless you look up inside the hood, is the exterior of the hood and that’s an easy surface to clean. Secondly, cleaning the filter is nasty but straight forward however the duct can be downright disgusting and can require special equipment. In real estate priced at a million and up the homeowner typically has a housekeeping service and just assumes that those nasty chores are being taken care of. However few services will include cleaning the duct as part of their base contract. The result is an area in the home that is a potentially dangerous fire hazard that also serves as a feeding trough for vermin and insects. And you’re thinking about buying it? If you are considering buying a luxury home in Fort Lauderdale and you have a professional inspection performed that reveals a mess In the kitchen duct, you will want to ensure whose responsibility it is to clean it up. If the homeowner doesn’t want to do it you should be able to use that item, and others revealed by the inspection, to negotiate a serious discount in the sales price. We’ve already done an article on cleaning oven hoods and filters so let’s focus on the duct. If the filter was filthy odds are the duct will be worse and you will need to call in a service to get the job done right. They will need to place plastic sheeting over the stove and surrounding areas and the floor hopefully shaped in such a way to channel the liquid grease into buckets. Inside the duct will be liquid grease, solid grease, food particle debris and debris left by insects. 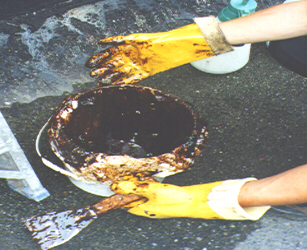 The liquid grease can be scraped onto the plastic sheeting to drain into the buckets. To get the remaining grease and debris will require either spraying the area with a degreasing chemical and rinsing with hot water or a specialized machine that boils water, adds solvent and pumps the solution into the duct at about 2000 psi. Once the duct is clean, some professionals will actually wax the duct to make subsequent cleanings easier. What you can’t do is ignore the condition. Somebody is going to have to pay, just make sure it isn’t you. If you have questions on this issue or professional home inspections call us today and we will be happy to assist.